Hey, all. Here’s a tool for putting masts on our SIB’s. It lets you guide a mast through the neck of a bottle horizontally and then rotates the mast to vertical to its place on the hull and then releases it. Basically, it’s a small diameter brass tube with a steel wire in it that is attached to a link that pivots. I don’t intend to write a novel and I don’t think anyone wants to read one here so I’ll try my best to explain. It’s probably obvious that moving the wire causes the link (wood material) to pivot. 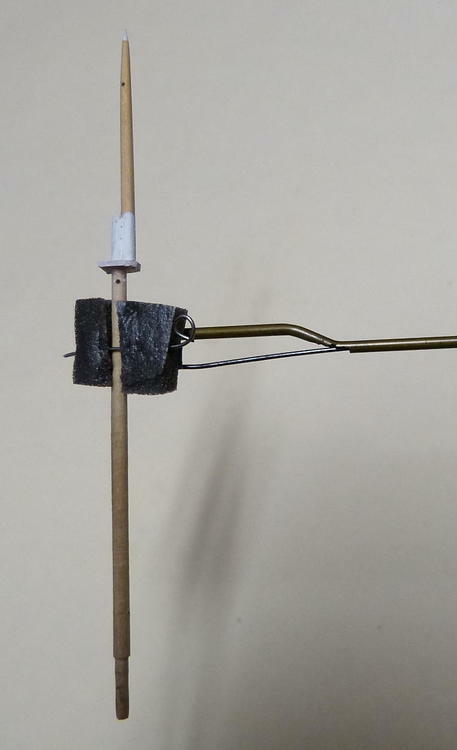 The pivot is a straight pin that was bent to a 90 and epoxied to the brass tube. 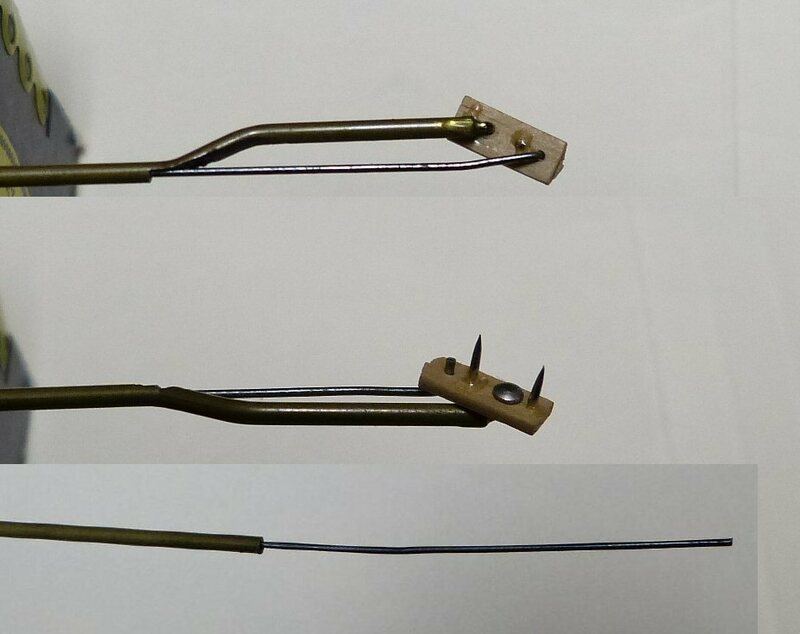 The two barbs on the link are clipped ends of pins. The sticky backed foam is stuck to the barbs and the blue tape helps. The foam has a slot for the mast. An important part is what I would call the release wire. It creates tension with the foam until removed. An important part is after the mast is guided in and the wire is pulled slightly to rotate the mast to vertical and then placed in the hull, the tool needs to be released. This is a critical time because the mast is somewhat attached to the hull and positively to the tool at the same time. A careless movement could cause breakage. Here’s what to do: attach a thread to the loop on the release wire to pull the wire out. The tool will immediately disconnect from the mast. In the pics, note the range of the rotation that be had; only 90 deg. is basically needed. The first pic shows both sides of the link and the opposite end. Wow! I love it. That's ingenious. This could be used for taking measurements of the bottle height too. I posted a short YouTube video of measuring inside of the bottle using this tool. 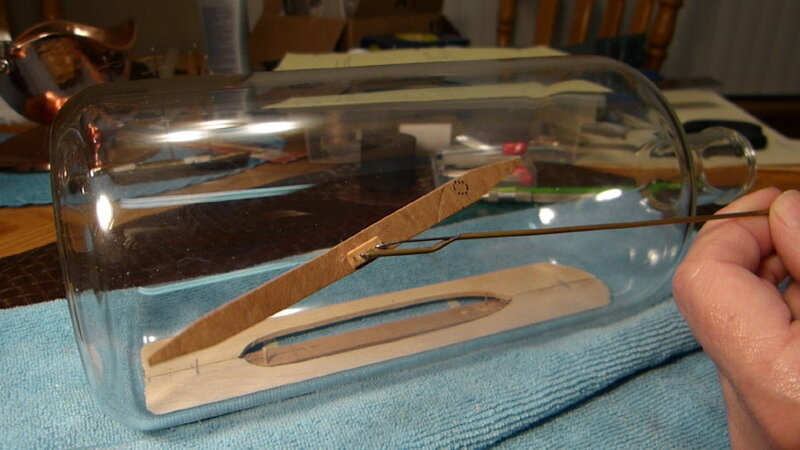 No link here but search: Ship in a Bottle insertion tool . Here's a link to the video of the placement of the foremast on the W.H. Dimond using this tool. Excellent job on the tool and placement of the mast!